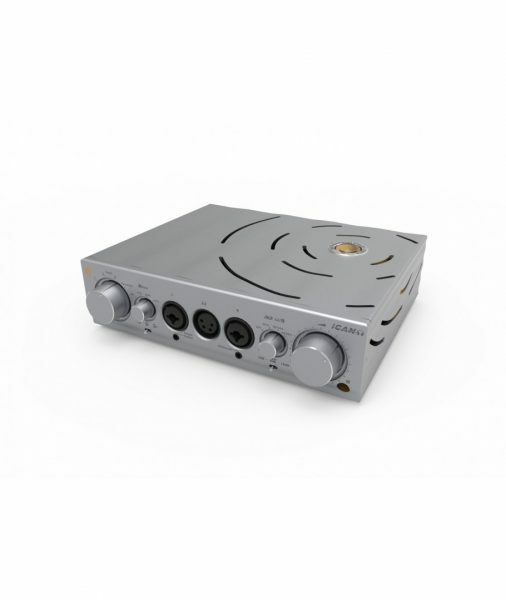 …and audiophile line-stage.The Pro iCAN has at the core, a Japan Alps motorised rotary volume potentiometer. This is the ‘6-Track’ version with 4 tracks used for a true balanced volume control. 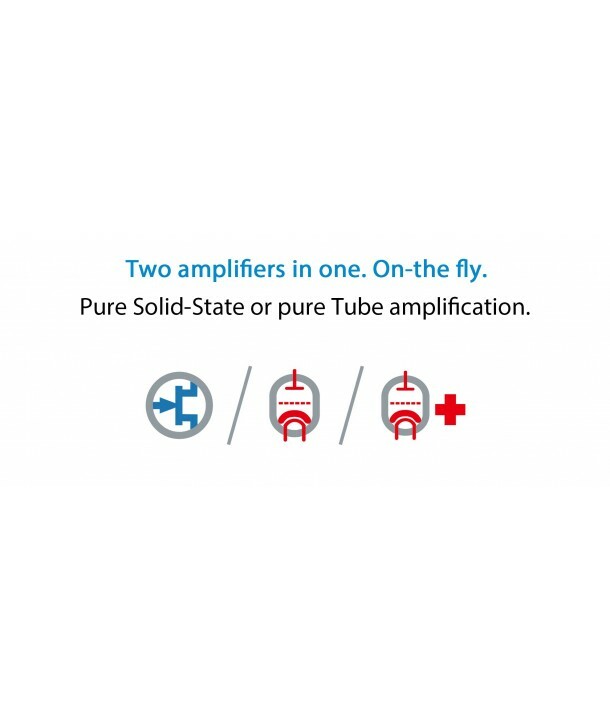 This is the litmus test for any amplifier to see if it is truly balanced, or operates internally in single-ended mode. Those using ‘2-Track’ volume controls may offer balanced in and out, but are not true balanced designs. The Pro iCAN however is fully-balanced from beginning to end. 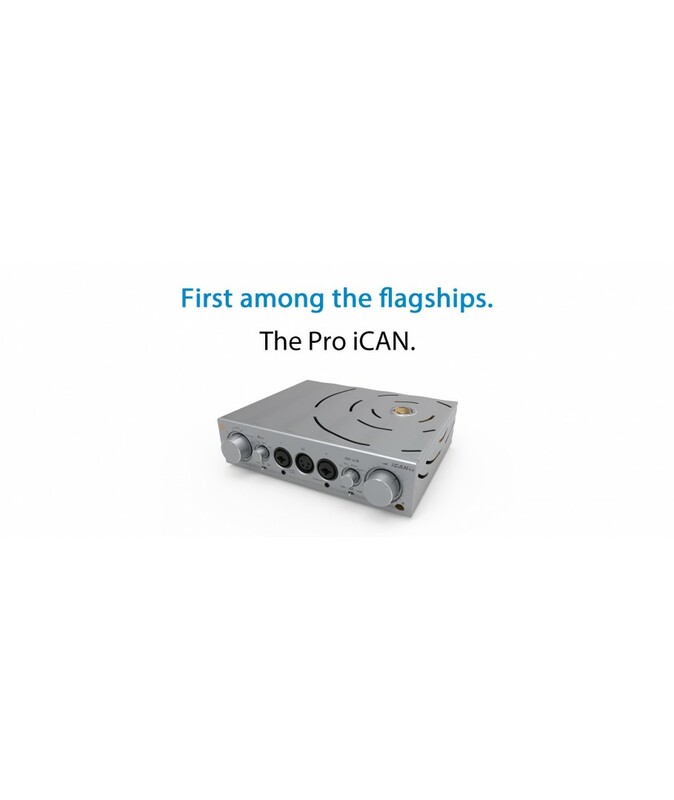 In terms of flexibility, 3 single-ended and 1 balanced inputs and 1 balanced and 1 single-ended output, the Pro iCAN is a full-function audiophile line-stage that is at home in many expensive hi-fi systems. Its user-selectable Solid-State/Tube amplifiers remain and so are 3D Holographic˚ for Speakers and XBass˚ for ultra-fidelity home audio systems. Internal Circuitry: Single-EndedThe majority of ‘balanced’ high-ended headphone amplifiers are actually single-ended amplifiers with balanced inputs and outputs. The balanced input will be converted into single-ended operation inside the amplifier, then converted back to balanced just before the output:The following block diagram depicts the balanced input through to the amplifier (orange) which afterwards, reverts to single-ended and runs through many single-ended stages before then going to the balanced outputs. In detail: The balanced input signal will first be converted into single-ended operation by extra circuitry added to the single-ended signal path. The volume control and actual headphone amplifier are formed by a pure, single-ended circuit.To provide balanced drive to the headphone, the signal is inverted using more circuitry added to the single-ended audio path. A sure fire giveaway of such circuitry is the use of a 2-Deck volume control (c.f. 4-Deck for true balanced circuitry), as well as having more than four gain/current buffer blocks among two channels. At the input, the additional balanced to single-ended conversion circuit generates extra noise on top of the volume control pot. At the output, the inverter circuit used to create the balanced signal simply doubles the signal, noise and distortion of the amplifier, nothing is reduced or cancelled, only added. So one gets double the signal but also double the noise and distortion. Hence this is truly a case where MORE IS LESS. There is much more circuitry, but far lesser performance, both objectively and subjectively. Internal Circuitry: BalancedThe Pro iCAN however, is true balanced end-to-end, from the input all the way through to the outputs. It operates with full-differential internal signalling, meaning the signal is always remains two separate signals of equal level but opposite polarity. This is what we call True Differential Balanced®. In detail: The Pro iCAN circuit is fully-balanced with completely equal circuit sections for Positive (Hot) and Negative (Cold) signal phase of each channel. The Volume control has 6-Decks, two decks each control the volume of one channel, and the other two decks are used for monitoring the volume control operation. 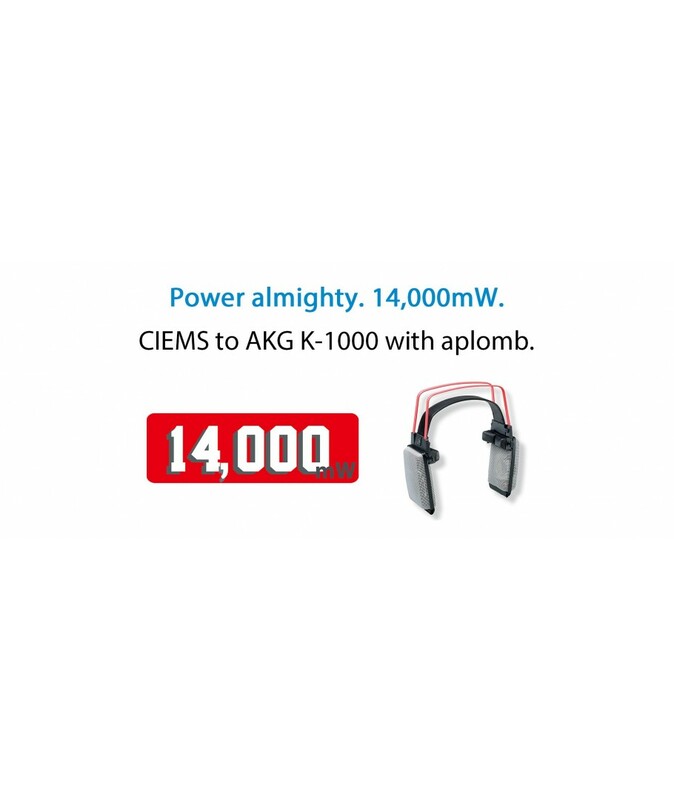 This exceptional volume control potentiometer is custom made for iFi by ALPS Japan and has no parallel from other makers.But, as the two halves of the volume control and the two halves of the amplification operate differentially, they effectively become a single stage. So the circuitry is highly elaborate in actual implementation, yet it comes down to the simplest design possible for a headphone amplifier, that is a volume control, a gain stage and a current buffer*. Compared to a single-ended design with exactly the same circuit, True Differential Balanced® lowers noise by 3dB and also lowers THD dramatically over the. Additionally, it allows the signal level to be doubled, so True Differential Balanced® circuitry also produces 9dB (or 3 times) greater dynamic range. In professional audio, ‘Balanced Amplifier’ only means the Input/Output connections are balanced, the internal circuits are actually single-ended (if the internal circuit is also balanced, it will be called differential). But in the Hi Fi world, most people view a ‘Balanced Amplifier’ as balanced all the way, from end-to-end, and incorrectly assume even the internal circuits are balanced. Tube/ Solid-State Real-time SwitchingCompared to high-end headphone amplifiers, the tube stage of the Pro iCAN is different in two-ways. First, we don’t use good-quality 6922s or similar. Instead we use the very best; General Electric 5670 which is the premium variant with a different pinout. Western Electric with their own premium version of 6922First introduced by Western Electric in 1946 with the WE396A, from the 1950s onwards (and for the next 30 years thereafter) General Electric (and several other tube/valve manufacturers) followed Western Electric with their own premium version of 6922. This range had controlled warm-up and tight specifications on grid-current, noise and microphony. The result, significantly smoother and more organic sound qualities. The Solid-State amplification section of the Pro iCAN is just as seriously executed as the Tube amplification section.The amplifer audio circuit is a development of iFi’s revolutionary ‘TubeState’ design. It is fully discrete, fully-balanced with either tube or J-FET input switchable, bipolar second stage and MOSFET-buffered bipolar class A Power stage (with Class AB for low impedance headphones at very high levels). The resulting circuit may be best described as ‘tri-brid’ where each device is used to greatest sonic advantage while minimising any drawbacks. Furthermore, the circuit is pure DC coupled to avoid using any sonically-degrading coupling capacitors. 3D Holographic Sound for HeadphonesAs stereophonic recording and reproduction became widespread in the 1950’s, a glaring problem was noticed when replaying such recordings through headphones. Like the Blumlein/EMI Stereosonic corrector, the Bauer/CBS corrector was eventually forgotten and never gained much traction. With the increase in headphone listening in the 1980’s due to portable stereo radio’s and the visionary Sony “Walkmen” Cassette player, the Bauer/CBS corrector was revived and became known generically as Crossfeed.However, while traditional Bauer crossfeed and its various derivatives do substantially remedy the “in-head localisation” problem, the result is a sound stage that may be best described as “wide mono”, much of the natural spaciousness of recordings are lost. So Bauer/CBS derived crossfeed is still a rare feature. More often than not gimmicky and sound degrading DSP algorithms are promoted as enhancement to headphone listening that only distort the original recording more, rather correct the fundamental problem. At iFi we have been building on research that extends as far back as the late 1980’s at the RFZ in Berlin, which suggested that a very different Matrix to the Bauer/CBS one is required and that additional martix coefficients are required to present a natural and spacious soundfield, like that from a speaker based stereophonic playback system. Starting with this foundation we have applied further research and large scale listening tests to derive a purely analogue matrix, that translates a spacious stereophonic recording with good imaging when replayed on speakers into its equivalent when listening to headphones. That is 3D Holographic Sound for headphones, not crossfeed, not crossfeed plus something, but a fundamentally new way to correcting recordings made for speakers to replay correctly on headphones. 2. Increase the width of the apparent soundstage beyond the width dictated by the loudspeaker placement. 3D Holographic Sound for LoudspeakersThe 3D Holographic circuit for loudspeakers corrects a distortion of the sound field caused by recording via microphones and playback via loudspeakers. This sound field distortion was first described by Alan Dower Blumlein (the Inventor of Stereophonic sound) and corrected by EMI in early ‘Stereosonic’ recordings. However, the original Stereosonic circuit tended to result in a narrower soundstage than if recorded straight and often overcompensated distortion of the soundstage perspective. iFi’s 3D Holographic systems avoid this and instead, allow an expansion of the width of the sound stage. These modes can also be used to enhance the imaging of recordings that offer poor spatiality. Different recordings and different headphones exhibit different frequency responses. XBass is an analogue signal processing (ASP) circuitry and it is sonically superior to Digital Signal Processing (DSP) systems. XBass is tailored to correct the bass deficiency in the headphone/loudspeaker and achieve the desired level. It is NOT a traditional tone or loudness control and provides a minimum of 12dB boost at 10/20/40Hz. The Pro iCAN employed TDK Japan-made C0G type capacitors and Vishay MELF type thin film resistors. These are complimented by Panasonic Japan-made ECPU Film Capacitors explicitly designed for audio use with extremely low distortion (<0.00001% @ 1V/10kHz). We employed ELNA Japan-made Silmic II capacitors for the power supplies. These use special silk fibre paper for the isolating barrier resulting in decreased odd-order distortion and reduced microphonics/mechanical resonances. As one can see, the Pro iCAN despits its ‘desktop’ footprint is absolutely chocked full of premium components yet with a 4-layer pcb, has the ultimate topology in signal path layout/grounding.There is just no more ‘real estate’ left to develop. It truly is deserving of the iFi flagship mantle.